I put these step-by-step instructions together for some friends of mine that have a website on how to add an image to a WordPress post or page. I know how frustrating it can be to just add a simple image so hopefully with this tutorial it will make it a lot easier for you. To begin, make sure you are logged into your WordPress Dashboard and are on the post or page that you want to add an image to. After you click on Add Media another box will pop up. Click on Select Files, choose the image you want to add then click Insert into Post. From here you can either choose to upload a new image or choose from an image that you have already uploaded to the Media Library. For this tutorial we are going to add a new image. Click on Upload Files. 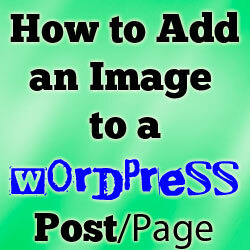 Once the image is uploaded you now tell WordPress where/how you want the image to be displayed. Do you want it to the left, right or center? Will this image link to another page and what size would you like the image to be? You can answer all these questions in the box that appears to the right after you have uploaded the image. There you have it! You have just added an image to your post. What if it’s not positioned where you want it or the size is not right? Another window will pop-up. Under the Edit Image tab you have the ability to make the image smaller (Note: you can’t make an image bigger only smaller). You can change the location of the image as far as having it to the left or right of words or in the center of the page. If you choose to have the image link to another page on your site or to another site you can insert the URL in the Link URL box. The second tab is for Advanced Settings and you can make the image small here also but you also have the ability to put some spacing between the image and verbiage. To do so simply put in a number where it says Vertical/Horizontal space. I usually go with a #3 or #5 and then if you want a border around the image put a number in the box that says Border. Keep in mind the higher the number the larger the border will be around the image. If you do choose to link your photo to another page outside of your site I HIGHLY recommend you click on the box next to Open Link in New Window. What this will do is if your visitor clicks on the image and is taken to a new site it opens it in a new window so if they close that site your site is still there in the back ground. There you have it. Wasn’t so bad was it? Are there some other things in WordPress that have you stumped? Let me know and I’ll be more than happy to write up a step-by-step tutorial on how to do it. I am so glad I came across your blog. I have just started using WordPress and your step-by-step guide is exactly what I need. I have bookmarked the page and will follow your steps. Thank you for your offer of help with other WordPress topics. I may well take you up on that.